Start with 1/4 cup of washing soda and a little hot water! You can pour this directly into your dispenser if you can mix it well enough or I like to mix it in a small bowl until dissolved. Then add 1/4 cup Baking Soda and mix until dissolved. Pour this mixture into your dispenser and add a gallon of water. mix all together and that’s it! Use 1/4 cup of the detergent for each load. I love how much this detergent neutralizes odors! where I originally heard about this detergent. Even with my items costing a little bit more than her listed prices, my detergent comes to less than .10 cents a load! Compare that to the last detergent you bought off a grocery store shelf and let me know how much $$$ you’ll be saving! Now let’s talk about where to buy all the supplies and ingredients! The majority of supplies and ingredients (everything except for the young living products) can be found at walmart, target, or any grocery store near you. But, if you’d like to save a trip to the store and order online here’s what I found on Amazon. Do you think you’ll give this a try? I’d love to know if you make a batch of this! 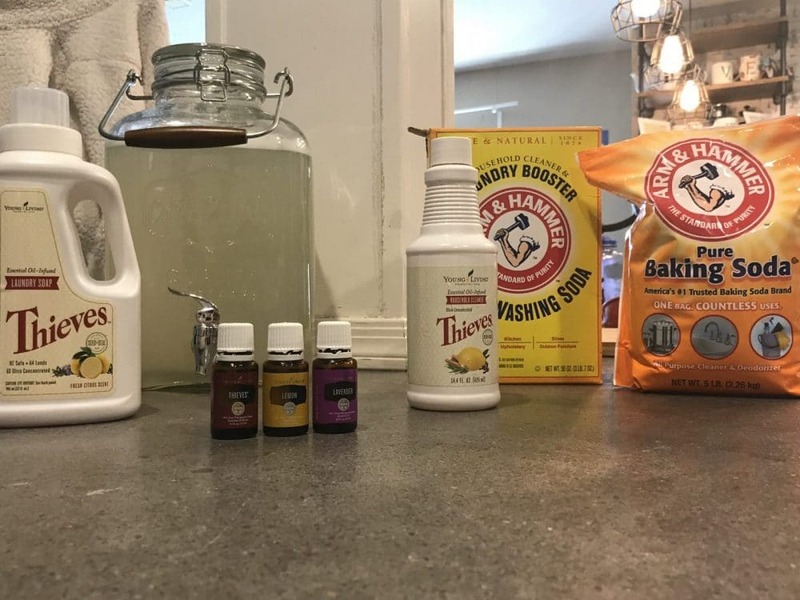 This entry was posted in Essential Oils!, Products We Love and tagged budget friendly, diy, essential oils, homemade. Bookmark the permalink. I’m waiting for my dispenser to arrive in the mail (hello Target gift card!) and will be making this.